Managing Music Ministry: Beyond the Notes and Chords confronts the everyday issues faced by those managing a church music program. Divided into two sections, this book covers not only the management of a music program but also the musical and non-musical issues a music director encounters. Together, Stephen Petrunak and Fr. Randall Phillips share their knowledge and expertise gained collectively from more than 15 years of corporate experience, 40 years of music ministry leadership, and 30 years of priesthood. Petrunak guides readers through the management of people, conflicts, financial resources, and time while Fr. Phillips considers the spiritual elements of leading a music ministry. 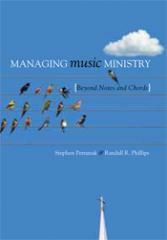 This book is a practical, insightful guide for anyone managing a church music program.